Cot Deal spent 11 years in the Cardinals organization as a player, coach and manager. As a Cardinals pitcher, he yielded three consecutive home runs to the Reds in the ninth inning _ and won. In the minor leagues, he managed Bob Gibson. His most memorable feat, though, occurred in his first year in the Cardinals system with Columbus (Ohio) of the Class AAA American Association. In what The Sporting News described as “one of the greatest exhibitions of mound stamina in minor league history,” Deal pitched a 20-inning complete game. Though his 50-year career in professional baseball sent him across the country, Deal always returned to his native Oklahoma. He was born Jan. 23, 1923, in Arapaho, population about 400, in Custer County. His given name was Ellis Deal, but he was called Cot as a boy because of his cotton-top hair color. Signed by the Pirates while in high school, Deal was a third baseman and outfielder for three years in the Pittsburgh system before he entered military service. After three years as a training instructor for the Army Air Corps, Deal was discharged, acquired by the Athletics from the Pirates and sent to Class AAA Toronto, where he was converted to a pitcher. In 1947, the Red Sox acquired Deal and he spent parts of the 1947 and 1948 seasons with Boston, posting a 1-1 record and 7.02 ERA. 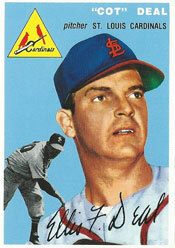 Deal, 26, opened the 1949 season with Louisville, a Class AAA affiliate of the Red Sox. In May, he was traded to the Cardinals for a minor-league infielder and assigned to Columbus. Four months later, Sept. 3, 1949, Deal started against Louisville, pitched 20 innings and got the win in Columbus’ 4-3 victory. Deal also contributed four hits. Columbus likely would have won in the 10th if not for a loose shoe. With the score 1-1 and Les Fusselman on first base, Deal doubled to right. As Fusselman rounded third, he lost a shoe, hesitated and hobbled on one shoe to the plate, where he was tagged out. Each team scored twice in the 12th. Columbus snapped the 3-3 tie in the bottom of the 20th on an RBI-single by Roy Broome off Gordon Mueller, who pitched nine innings in relief of starter Jack Griffore. During the Louisville-Columbus game the next afternoon, “Deal was applauded and cheered every time he stuck his head out of the dugout,” The Sporting News reported. In 1950, Deal pitched in three games for the Cardinals, but spent most of the season at Columbus. A switch-hitter, Deal converted back to being an outfielder for Columbus in 1951 and hit 18 home runs, but he returned to pitching the following year. Sent to Class AAA Rochester, Deal was 14-9 in 1952 and 16-9 in 1953. Deal opened the 1954 season with the Cardinals and was part of the bullpen that posted the worst ERA (5.46) in Cardinals history. He appeared in 33 games and had a 2-3 record and 6.28 ERA. Deal’s second and final win for the Cardinals occurred in a wild Sunday afternoon game at Cincinnati. Entering in the third inning for reliever Gerry Staley, Deal held the Reds scoreless for five innings and St. Louis went into the ninth with a 14-8 lead. In 1956, Deal was a player-coach for Rochester manager Dixie Walker. He replaced Walker as manager in 1957. In 1958, Bob Gibson was promoted from the Cardinals’ Omaha farm club to Rochester in June and thrived under Deal. Gibson, 3-4 at Omaha, was 5-5 with a 2.45 ERA in 20 games for Rochester. On Aug. 3, 1958, Deal lifted starter Lynn Lovenguth after one inning and brought in Gibson, who pitched eight innings, holding Miami to three hits and earning his first win for Rochester. Deal returned to Rochester for a third season as manager in 1959. On Aug. 1, he resigned after Rochester lost 20 of 25 and was replaced by Reds pitching coach Clyde King. Reds manager Fred Hutchinson then hired Deal to be Cincinnati’s pitching coach. Deal coached for 15 years in the big leagues, including serving as pitching coach for manager Johnny Keane with the 1965 Yankees.